The previously rumored Sigma 18-250mm f/3.5-6.3 DC Macro OS HSM lens is now official. Adorama has the price listed as $499. The Canon version is expected later this month, Nikon mount will be released in July, Sony and Pentax versions will be out later this year. The current 18-250mm model will be available for sale through the summer. Sigma also announced a price drop on their 70-300 APO Macro lens (currently $199). Ronkonkoma, NY, June 15, 2012 – Sigma Corporation of America, a leading researcher, developer, manufacturer and service provider of some of the world's most impressive lines oflenses, cameras and flashes, is pleased to announce the availability of its new Sigma 18-250mm F3.5-6.3 DC Macro OS HSM lens starting in July 2012. Pricing is still pending. Sigma optimized this lens’ power arrangement by incorporating double-sided aspherical lenses and reexamining the design to achieve a more compact filter diameter. The lens has an approximate 13x high zoom ratio with a filter size of 2.8 inches in diameter. Sigma’s unique OS system, as well as one Special Low Dispersion (SLD) glass and three aspherical lens glasses, compensate for camera shake and enable correction of color aberration, respectively. 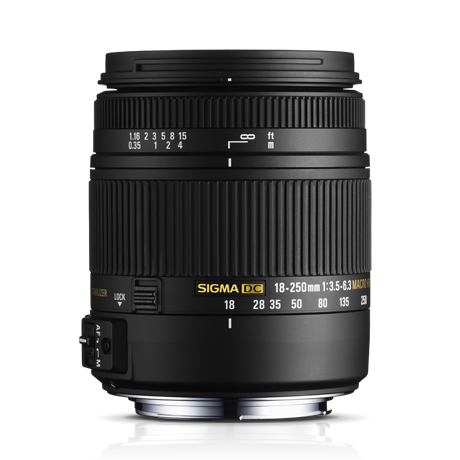 This lens will be available in Sigma, Sony, Nikon, Canon and Pentax mounts, starting with Canon mounts coming in July, 2012. Pricing and all availability for other mounts have yet to be announced. To locate an authorized Sigma dealer nearest to you, visit http://www.sigmaphoto.com/where-to-buy-sigma. For information about Sigma Corporation of America, visit www.sigmaphoto.com.